Catbus» Blog Archive » Montreal Tram Study – Going About it the Wrong Way? Montreal Tram Study – Going About it the Wrong Way? A Montreal tram report studies the viability of a starter line. However, the proposed line includes a downtown loop, a section with questionable utility. Also, the proposed construction costs are too high. If we want a sensible network of trams that improves rides for as many people as possible, we need to focus on utility, and we need to aggressively contain costs. As you can see from the above map, the line consists of a corridor along Côte-des-Neiges and a loop around the Old Port. The line is on separated lanes on its entire length. The base service frequency is intended to be around 8 minutes. During rush hour, the Côte-des-Neiges corridor would see the frequency double to every 4 minutes. During the “peak downtown period”, the pattern would reverse, with the downtown loop now having its frequency doubled to every 4 minutes. It is great that this study was finally released. It would be nice if the AMT did this too. 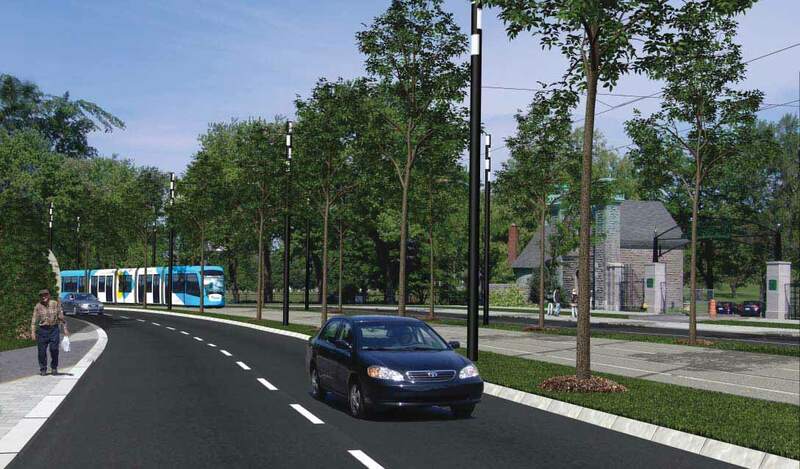 Its also good news that the basic viability of trams in Montreal is shown. But looking over the documents, there are some issues that I would like to raise. The first thing to notice is the loop around Old Montreal, a section that seems to be a rather bad piece of planning. Actually it’s not a complete loop with trains travelling in a complete circle, because it’s disconnected at the north-west corner, where trams terminate and turn around. The construction of this loop seems to be mostly driven by political interest, and from developers. In general, downtown circulators are a bad idea, they underperform. They are not useful for enough people. They don’t let you travel the shortest distance to where you need to go. Many travels along small loops are faster by walking directly, rather than waiting for a train and taking an indirect route to a nearby location. In 2008, The STM established the 515 bus (now 715) as a precursor for the planned tram (except that it actually runs in a complete circle). Already by Decemeber the failure of that line was obvious, with only 1200 daily boardings rather than the projected 6000. According to ridership data from 2011 that I extracted from Opus card data, there were less than 800 daily boardings on that bus. That is not nearly enough for a tram. and given that there are many bus corridors with fifty times the daily boardings like Pie-IX, Sauvé, Saint-Michel or Henri-Bourassa, focusing on this section is misguided at best. 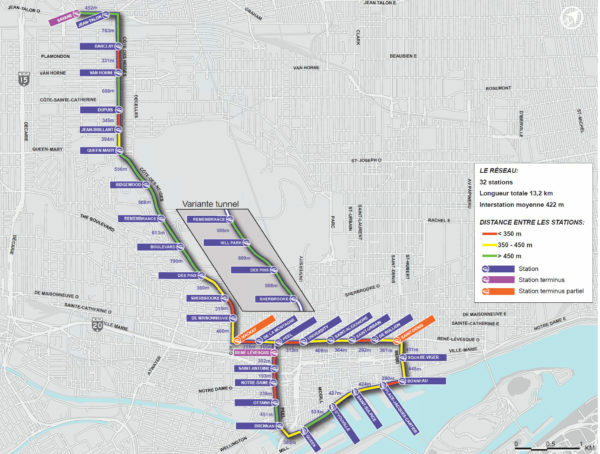 We see that according to the projections the Côte-des-Neiges section shows much more potential than the downtown loop, which simply cannot attract riders. And those numbers may be optimistic, just like the projections for the 515 bus. Many riders may also only be seasonal, and that’s not just tourists. And the Côte-des-Neiges and downtown loop section appear to have non-connected ridership. Trams are nearly empty somewhere along the middle of the line. There are few potential trips that cross those points. Overall, the downtown loop is simply a waste of money considering the transportation needs of the greater Montreal region. The only section along the the loop that has some potential is the Peel corridor along the West of the loop. 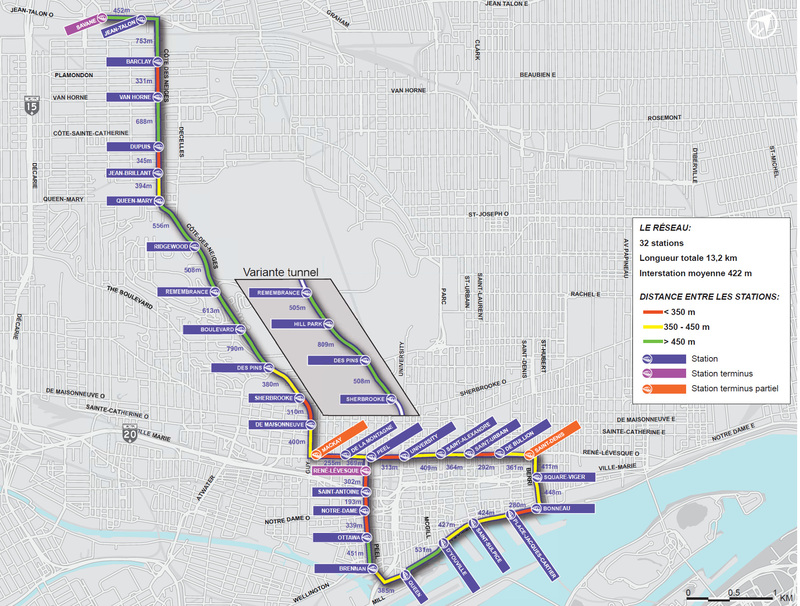 That portion overlaps with the another transit plan along the Champlain bridge light rail. This is a transit project to connect the Shore suburb of Brossard to downtown, via the replacement Champlain through Nun’s island and Griffintown. That project is very worthwhile and would make the less than 2km track along Peel redundant. The above table shows that the the Côte-des-Neiges corridor is a better than the one along Parc, which appears reasonable. But why were the two corridors compared for their potential, but the downtown loop was included in both cases seemingly without question? The two compared corridors have similar ridership, so it appears natural to just connect them into one line which will have fairly balanced ridership. This would almost exactly follow the successful rush-hour-only 435 bus. It would be possible to “unroll” the downtown loop, and instead build it along the Parc corridor. The length of that line would be about the same as the one proposed by the study, ~13km. This line would replace the 80, 165 and 435 buses, which together have about 60K daily boardings (in 2011) – when one considers the possibility of induced demand, it should be obvious that this is a much more worthwhile starting segment than including the proposed loop with only one of the useful corridors. Because of only the small section of 12%, all the trains have to be able to climb that grade. If excluded, the ruling grade is 10%, which is generally considered the maximum for trams. This may result in less technical complexity, more bidders on the rolling stock, and less cost for vehicle acquisition. The cost is currently budgeted at 850$ million for 13.2km, without taxes and contingencies, a billion with those included. That means about 65$ million/km without taxes and contingencies, and 75$ million/km with. This appears pretty high. For example, the French city of Besancon is building its initial 14.5km line for 22 million$/km. This is of course only one data point. 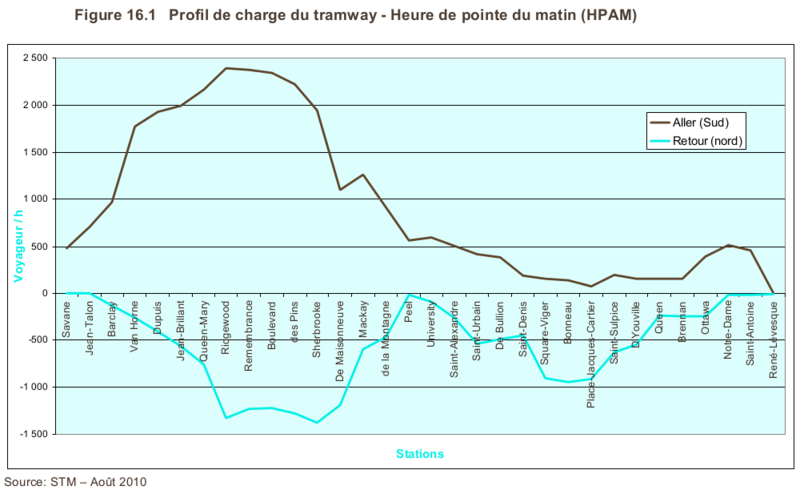 the Montreal tram study compares to five different French data points to show that the cost are not too high. To get a more thorough comparison, I compiled a list of about a hundred French tram construction projects. It covers projects from the beginning of the tram renaissance at the end of the eighties, to projects being planned now. The numbers are all without taxes, adjusted for inflation relative to 2010 (to compare to the Montreal study) and converted to dollars using the average rate of that year (1.37$/€). 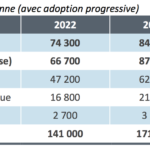 According to these numbers, the construction costs in France for a kilometer of tram are about 35$ million/km on average. In comparison, the Montreal costs are estimated 85% higher than that. (I will publish the data and more details in another blog post soon). French tram projects aren’t actually considered cheap. They tend to include a lot of urban improvement and renovation of the streetscape, and are built to a high visual standard. They are used as drivers for development not just via transportation, but also urban beautification. The tram systems tend to be a little over-designed. Some of the systems include short tunneling sections. The French also like to avoid overhead wiring in their historic city centers, using a system called l’alimentation par le sol (APS), a ground level power supply, which adds to the cost. Compare to Germany, where trams are used as a form of transit to bridge the gap between buses and subway, rather than a chance to beautify the city. There, tram construction costs are generally considered to be at around 10 million €/km (14 million$/km) and 15million € when built in downtown (21 million $/km). A more utilitarian approach is also what allowed Besancon to keep its tram construction low. There are some budget items in the Montreal project that are inherently more expensive than elsewhere, for example the maintenance center and garage. It has to be completely indoors, due the climate. But overall, the construciton costs should be lower, because the project is comparably simple. 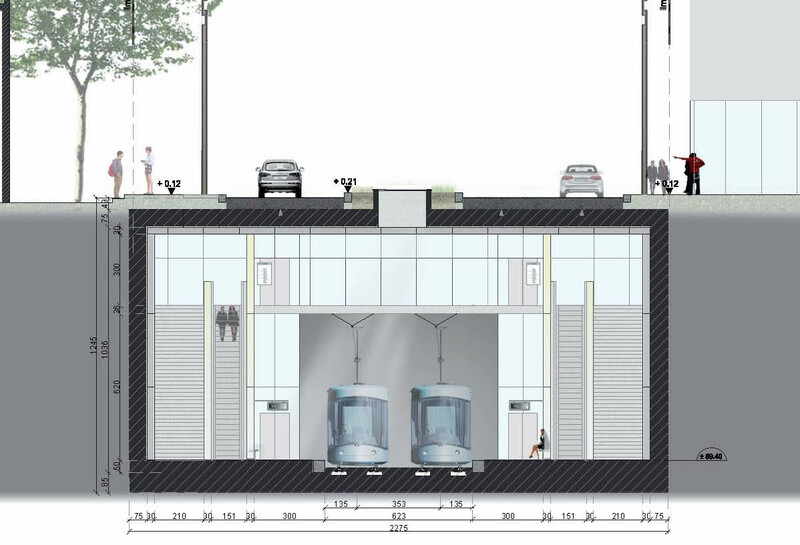 The tram can be completely contained inside the existing streetscape. There are no heavy works required like rebuilding bridges. It shouldn’t need any of the features that drive up cost, for example tunnels or ground level power supply. And while nice, it doesn’t need urban beautification along its entire length. The study includes a 100$M option for a 500m tunnel under Pine, providing better access to the Montreal General Hospital via an underground station. This is probably not a worthwhile investment. But note how over-designed this tunnel station is: wider than some metro stations, three elevators, 12m deep, and a tunnel height of 6.2m. It could be designed with a 6~8m island platform, directly under the street, with a single elevator and stairs, no mezzanine, and tunnels that are barely higher than the trains themselves. What is the Role of a Tram? All trams are not created equal. There are different paradigms of how trams are built and what exact purpose they have in terms of transportation and urban development. In France, the tram systems built over the last twenty years have been urban development and renewal projects as much as they are transportation projects. There has been great care to integrate those trams into historic centers with its pedestrian areas, and a lot of money spent on beautification and new technology that avoids overhead wires in certain sections. At the same time, they are the major mode of transport in some medium size cities (i.e. around and less than a million). Some of those metropolitan areas are pretty compact, so these systems have high ridership. In the US, the development potential of trams has been recognized. Now there are a few new projects underway to build streetcars. Many of these projects have little transportation value, using single, short lines, sharing space with cars. Some are only single track for portions and have very low frequency. These projects appear to be built solely for their development potential. In Germany, trams tend have more utilitarian transport character. They are built generally as pure transportation projects, in corridors where ridership is expected to be between about 4K and 30K~40k per day, above which rapid transit is favored. Towards the high end, they tend to build subway-tram hybrid systems (Stadtbahn), which attempt to combine advantages of subway (high capacity/speed downtown) with trams (cheaper construction or possibility of re-using existing systems to get good coverage). So what Role Should Trams Have in Montreal? The released study appears to orient itself very closely to the French model of tram building. That’s evident not just in the use of pictures and comparisons for cost and rolling stock, but also how the development of the line is envisioned, the complete re-configuring of streets. The loop around the old port may also be an attempt to replicate the image of the French tram through a historic city center. Given the high cost of the project relative to its transportation value, especially in comparison to other tram systems, I’m concerned that we may end up with a project that is largely a development stimulus one. The chosen paradigm may not lead to transportation improvements throughout the city, simply because building a large network at this cost is not economically viable. This is problematic for our transportation starved city. Montreal is currently a major bus city, with many people spending large amounts of time in crowded buses feeding into metros. Some of our bus corridors have more ridership than the 40K/day that Germans consider good enough for rapid transit, many more have lower ridership which can still be more economical to operate as trams. For many of these riders that live further away form the metro, trams could improve the quality of their commute, and thus the quality of life. A large network could spread the development and gentrification pressure, and allow less affluent people better access to jobs, again rising quality of live for everybody. Trams in Montreal should primarily be used to improve existing bus commutes. Tram projects should be about transportation, not helping development interests downtown. If we want to build as many tram lines as possible, we have to focus more on keeping the costs down. Construction should be simplified. For example, we don’t need to reconfigure entire streets. For the tram line in the study, we could do that just for the René-Lévesque Levesque corridor, and only few parts of Côte-des-Neiges. Beautifully rebuilt portion of Côte-des-Neiges where nobody lives and development potential is low. The downtown loop, with its relatively small transportation value, should be scrapped. Instead, the Parc Ave corridor should be preferred. If we aim for good cost/benefit in terms of ridership and improved commutes, one could also pick a completely different initial segment. why not start the tram outside of downtown, for example along the Pie-IX or Gouin/Henri-Bourassa corridors? Pie-ix currently has a expensive BRT project, at 20$M/km. 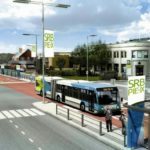 It suffers high cost (for a BRT project) due to a similar issue as the proposed tram: rebuilding the street. The project includes widening its right of way from 30.5 to 33.5m. With a tram, the transit right of way could be narrowed from the planned 8.40m (for two bus lanes) to as little as 6.35m (using 2.4m wide trams). Steal some more space from wide car lanes, and it will be unnecessary to buy land and cut down trees, and the higher cost of the track could be partly offset by reducing the street-widening costs. The maintenance center and garage may be cheaper further away from downtown. And the potential to improve people’s commutes is greater along that corridor, that sees long, crowded bus commutes. Other ways to keep construction costs down for any tram project may be to partner up with other Quebec cities that envision building trams, like Quebec City, (or the AMT for the Champlain bridge corridor), or cities that think about building trolleybuses, like Laval. The rolling stock and related expertise could be pooled and large orders be made, which result in lower per-unit prices. The development expertise and management may be shared and done in-house, potentially reducing costs (right now budgeted at 100$M before tax, nearly as much as the rolling stock). I really want trams to come to Montreal. But if we cannot keep the costs down, and the city has to plunk down a cool billion for 13 km, and the possibilities of building an actual network are slim, then this will just become another project in the region that envisions one short line and yet another technology. In that case, maybe it makes more sense to invest in much cheaper improvements to our bus corridors. Thanks to Kamal Marhubi and Julia Evans for reading drafts. Filed under buses, Montréal, trains. I sure hope that the commision’s focus on examples in France is not (only) because the documentation of those projects is available in French. Other countries, like Germany and The Netherlands have very successful tram systems, often built for a fraction of the costs. I hope politicians read this post and take note of your suggestions. Maybe you can have it translated in French and published as an op-ed in La Presse or Le Devoir? It’s a really good post and will be taken much more seriously when it’s available in French. This is a great analysis of the tram proposal. I imagine some of the over-designed elements of the proposal cater to construction industry. The old port bit is totally unnecessary. If they want to offer tourists transit to the old port they should a free mini-bus that does a hotels to old port loop. That would be less costly and attract tourists to other transit options. Great analysis. As soon as @andyriga posted the link to the study I saw that loop and thought “uh, oh”. You’re exactly right that if they are hell-bent on building the CdN part, then loop it back up Parc. IIRC, this is a *city* project and not an *STM* project, right? Granted, the last time the city did this type of thing (pushed a transit project in place of the transit authority), Montreal ended up with the Metro. I don’t see this one being as successful – at least the Metro lines followed the most heavily used streetcar lines! Still, it would be interesting to find out what the planners at STM (and AMT) think of this. Impossible to find out, I’m sure, but interesting just the same. I’m OK with transit driving development but that really should be a byproduct and not the goal of the project. Transit is to move people. I agree that development should be an important component of any transit project, but as a byproduct. Re what the STM wants, afaik their pet project is trolleybuses — which is insane given the increasing viability of battery powered electric buses. Trolleybuses combine the disadvantages of trams with the disadvantages of buses. In any case, there is an issue in the CMM that every organization is trying to push their own pet projects, which are sometimes redundant, sometimes competing, and there’s a lack of synergy. The Champlain bridge LRT pushed by AMT vs tram pushed by Montreal is one example of this. I’ve said it before: we need integrated, regional planning building a cost-effective regional transit network; not only exploiting network synergies, but also cost-synergies and reducing the number of different technologies used. Caught between not wanting to cede to much power to Quebec City (strengthened AMT) and needing an actual central authority to plan the movement of people. Sigh. The age-old thing. Seriously, a jurisdiction with abundant electric power needs to be using that to move people and not importing oil to do same. ETBs are a good step in that direction. And I see them the inverse of the way you do – the advantages of a bus (ability to get around obstacles) with the advantages of a tram (electric power and all the goodness that comes with that). Wherever you want to invest that much money in transit infrastructure, you want a separated right of way. Already for buses, with near zero investment in infrastructure, we are painting rush-hour-only lanes. Thus I think the obstacles argument is moot – if you pay that much money, make sure there won’t be obstacles. I sometimes think this argument comes from Torontonians who are frustrated their dinky trams are stuck behind a broken down car, but can’t muster the political will to just give the tram its own lane. Also, trolleys use trolley poles – 2 at that – rather than pantographs which are the norm for modern trams; so there are more problems for that. I don’t see trolleys as a stepping stone towards tram – I see them as technology lock-in. The requirements on the infrastructure are so different that upgrades seem unlikely. Do you know of any example where the upgrade path was bus -> trolley -> tram? A more reasonable upgrade path is bus -> 10 minute bus -> limited stop 10 minute bus on separated right of way (brt) -> tram. The point about wanting transit to be electric is valid, although maybe not important as people believe. The relative impact of full diesel buses is minor compared to individual cars (even if those cars are electric). But then I believe that electric buses are in the process of becoming technically viable — so I see trolleys not only as technology lock-in, but locking into technology that is right now in the process of becoming obsolete. And the AMT fails its regional planning: their focus is on expanding commuter rail into the exurbs – just look at the St Jean train study. There’s 4 million people needing transit, and they focus on a train to nowhere that will get maybe 5K riders. It’s prototypical symbolic transit, drawing lines on a map. I don’t think battery buses are any better than Diesel (or other liquid-fueled buses), because they still have to carry their own fuel. I suppose I need to actually dig up some studies to see the actual efficiency numbers. You are quite correct, of course – just get people the hell out of their cars whatever it takes. Effiency is almost irrelevant. Concentrate ridership along a good number of corridors so that the buses won’t run empty, and get people closer to where they work so that they travel fewer km, and you’ll get gains that are an order of magnitude more meaningful than Diesel vs Trolley vs Battery Electric. Battery powered buses are mainly because of noise and local pollution issues; also potentially operating cost; and possibly thirdly cuz of the smaller relative impact. ….and completely irrelevant to anybody thinking about building modern trams. This is just more developer fodder. It’s incredible how these overbuilt-yet-not-very-useful systems continue to be proposed and built. I have absolutely zero faith in the city of Montréal or any of its agencies to deliver reasonably priced and useful projects. They make the folks at Metrolinx look like savants. Sometimes I wonder what would happen if transit/rail planning was just outsourced to RATP or Deustche Bahn or someone who actually has the ability and exists outside of the system. I don’t believe in the trams. If you want to run it securely and efficiently (not bothered by the other chaos in the street, such as badly parked cars and accidents blocking the way), it really needs a separated area to run through and downtown just doesn’t have that space. There were comparisons with Germany, France and The Netherlands, however a huge difference that is overlooked it climat. The cities with the successful tramlines simply don’t have as much snow as Montreal does (seriously, as soon as there’s a tiny bit of snow and ice, the tramlines start having trouble). As stated, this will just be the next technology to be implemented, thus wasting tons (euh… millions) on development, construction and backup capacity (extra trams, in case of breakdowns) costs. 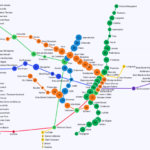 Why not extend the metro lines, even apart from AMT’s 2020 plans? Okay, the initial construction cost is huge, but we already have the rolling stock (since the trains on the orange line will already be replaced soon), the trained personnel, the technology, etc. People have been talking about the Pie-IX line, or extending Yellow-4 further into Montreal island. AMT studies also showed a huge need for public transit to downtown in Montreal-Nord and Ahuntsic. The “train de l’est” is surely not going to cover the load, since the distances between stations will be to big. They should rather skip some stations and have it run as an express train and serve smaller stations by light rail, all on parallel tracks. If I’m going to make this a long comment any way, I can’t leave out the fact that tunnel stations have always been constructed in way that doesn’t leave much room for elevators in Montreal (except for Lionel-Groulx). Why not have a single platform in the middle of the tracks? You’ll save on those elevators, escalators, signs, etc. Most metro stations in Amsterdam are constructed this way. To close this down: if people still want to have that tram in Montreal, connecting Chemin de la Cote-des-Neiges and Parc Avenue will have my vote. But why not letting it run through Ste-Catherine’s? We want to have those awful cars away from the core, make it safer (and nicer) for the shopping public to be in the street and during festival season, having it turn up De Bleury will surely de-congest the metro stations after the last concert of the evening at Place des Arts. The empty patch of land on those corners could make a nice little terminus with RESO (metro) access. The main challange here though is what to do with the other traffic on The Bleury, because it’s a main axis for north-south. Space might be too limited to think tunnels here. Also on big parts of Parc Ave, it’ll be impossible to isolate the trams from other traffic, making it more vulnerable to get stuck. Or is this just another argument for a new metro line under Parc, possibly having a last station in front of Quai Jacques-Cartier? Maybe even a new metro technology that could run above the ground and have it act like the short-stop service next to the Train de l’Est? …but maybe I’m too much of a dreamer. Yogi, first of all, the claims that tramways struggle in snow is quite wrong… or rather, they don’t struggle in it as much as buses. Montréal and Québec had tramways for 50 years and they kept running in the winter, tramways were very popular in the USSR, so even Siberian cities have tramways that keep running in winter without major problem. And that’s with 1950s Soviet technology. Here is a video of a modern Oslo tram running in snow, not only is it not much affected by the snow (it seems to have no problem braking and accelerating), but as they run on tracks, snow needs be removed only on the tracks, which is easy maintenance enough… just run tramways all night when you expect snow or icing conditions. In France, with tramways that are not necessarily made for much snow, tramway lines are more reliable than bus lines when it is snowing. You’re entitled to your opinions on tramways, but please don’t spread falsehoods about their supposed inability to deal with snow. Tramways are a tested technology that can deal with most snowfalls as long as basic maintenance is done. Of course, tramways aren’t as good as subways or passenger heavy rail (commuter trains), they’re not as fast, they’re more susceptible to obstruction from cars and the like, but they offer a better quality and higher capacity than buses. They’re nice for areas where subways aren’t really justified, but buses are overwhelmed, making transit unattractive. Building subways as a default is a huge mistake, subways are extremely expensive and should be put only when there is extremely high density. Otherwise, we get things like disaster that is the Sheppard line in Toronto, a subway line that cost a billion dollars, took 8 years to make and is used by 46 000 people every day, which is a ridership reached by some bus lines. If money and time was no object, okay, subways it is, but money and time are limited. For the price of a subway line, you can get three or four times as many tramway tracks, and can offer better transit options to a lot more people. Plus, tramways do attract a lot of investments in urban settings. In Portland, they made a short streetcar line, not even a proper modern tramway, and they realized that while before 20% of investment dollars used to go to the areas around where the streetcar line would be before it was built, after its construction, 55% of the investment dollars spent in all of Portland was spent in a one block distance from the streetcar line. The new developments were also much denser and efficient. The whole “planned” tramway project for Montreal is a real idiot’s proposal. I cannot understand why such money is being spent on studies when the whole concept is fundamentally flawed. There should be only one reason to have an electric tramway system, and that is to move people from point A to point B efficiently, quickly, and reliably. That means that any tram system must have its own right of way, separated from car traffic. That was the whole problem after the second world war, when people wanted cars to be the primary people mover in the city. You could not have both operating on the same street because of the density of car traffic that was allowed. The density of cars has even increased since 1959 when the last Montreal trams left the streets. Yes, Pie IX should be the first consideration for a tram system, on its own right of way as the street is wide enough. 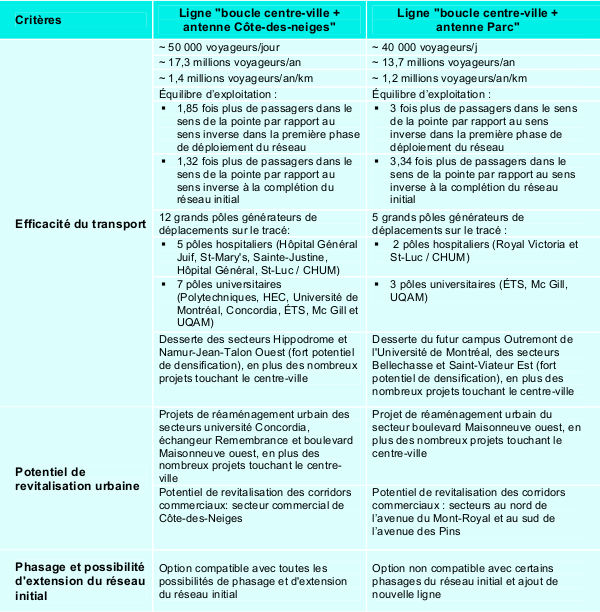 It can extend to Laval on the north, and tunnel to a subway station on the south. Ironically Henri Bourrassa used to have a rapid transit tramway system with its own right of way, scrapped in the late 1950’s in favour of a wide boulevard filled with modern cars. That street is still suitable for a tramway system on its own right of way. I am afraid that the same mentality still persists in Montreal that gave us the Metro: it was a showpiece more than a practical form of rapid transit. Rubber tires that are even more noisy than modern steel wheel on rail vehicles, inefficiency of rubber that produces heat in the tunnels, high maintenance costs for constantly replacing those tires, and incompatibility with other systems that would otherwise make bids cheaper than the Alstrom/Bombardier ripp-offs.